Be the first to share your favorite memory, photo or story of Maxine "Max". This memorial page is dedicated for family, friends and future generations to celebrate the life of their loved one. 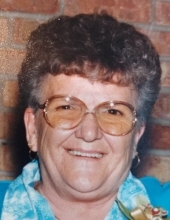 Maxine Joyce “Max” Miller Schauer, 92, of Pecatonica, IL died at 5:20 a.m., Thursday, April 11, 2019 in Presence St Anne’s Center. Born August 18, 1926 in Platteville, Wisconsin the daughter of Mr. and Mrs. Leonard and Gladys Bruss (Dean) McPhail. She married Clifford (Cliff) Miller following WW II and resided in Pecatonica, where they raised three sons, John, Richard (Rick) and Ron. Cliff passed away in 1981 and Maxine married Ray Schauer in April of 1984. Max and Ray resided in Pecatonica until Ray’s passing in June 2018. She was employed as an assembler by Amerock Newell for many years. Maxine enjoyed playing golf with Ray and was a fan of the Chicago Cubs; never missing a game on TV. Survivors include sons Ron (Jan) Miller and John Miller; five grandchildren; seven great grandchildren; one great great grandchild; daughter-in-law Charlotte (Alan) Miller-Abanes; niece Cathy Cook; step daughter Sidney Farr; step sons Bill (Jennifer) Schauer and Stan Schauer; 10 step grandchildren and 13 step great grandchildren. She was preceded in death by her parents, son Richard, daughter-in-law Cindy Miller, step daughter Susan Bloomer and brother Richard. Graveside ceremonies will be held at 11:00 a.m., Saturday, April 27, 2019 at Twelve Mile Grove Cemetery, Pecatonica, IL. Cremation rites will be accorded. A memorial is established in Maxine Schauer's name. To send flowers or a remembrance gift to the family of Maxine "Max" Joyce Miller Schauer, please visit our Tribute Store. Guaranteed delivery before Maxine "Max"'s graveside ceremony begins. "Email Address" would like to share the life celebration of Maxine "Max" Joyce Miller Schauer. Click on the "link" to go to share a favorite memory or leave a condolence message for the family.